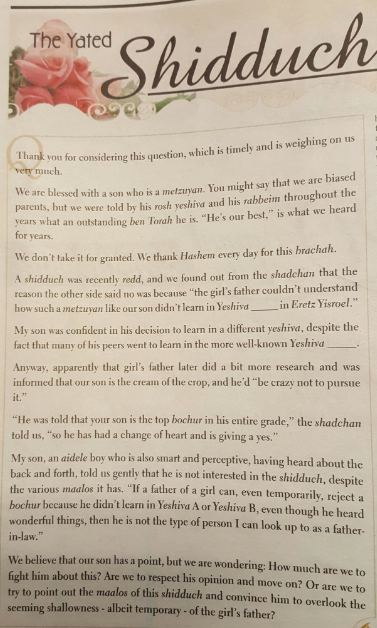 How many more Satmar kids will be taught not that they are proud bearers of their communities banner, but that they are the only authentic Jews! He seems to have forgotten that his blog is dedicated to the proposition that the only authentic Jews in the world are those that belong to his own sect, and that he and his co-bloggers have been throwing intellectual eggs at Open Orthodoxy and WOW for years. Those who doubt this are invited to review his own "Beyond the Pale" series of posts from 2007. Some are excusing this woman's choice of musical accompaniment, but I think its inconsiderate (at the least) for someone to make you to think about Auschwitz when all you want to do is watch a hula hoop routine. Will anyone post something dumber than this on the Internet today? What requires us to believe that women have more bina and less daas? 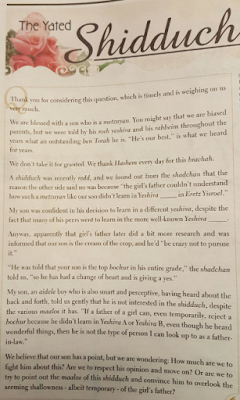 Is that a new ikkar emunah? Also what tests have been done to confirm the truth of this? And finally actual feminists don't insist men and women are the exact same. They insist that women should be afforded equal rights and opportunities. Also, the very worst female Olympian in Rio can beat you by a mile. So stands to reason there are women with far less bina and far more daas than you, as well. And if that's the case what do we gain from generalizations that hold back those women and force them into roles to which they are not suited? Also, as no one really knows what "daas" is it seems pointless to limit women or to deny them opportunity (beyond what the halacha minimally requires) on the basis of that aggadic statement about women having less of it. The guy who never learns Torah and never wears tefillin has nothing to be ashamed of on Tisha B'av. He can stand, unashamed and equal, alongside all the other Jews who also aren't learning or wearing tefillin on Tisha B'av. The guy who doesn't greet because he's depressed or ashamed can stand together with the rest of us on Tisha Bav. And so can the guy who doesn't groom. On this day, none of us shave or shower or wear fine clothes. If Shabbos is glimpse of Gan Eden is this a glimpse at death? All of us equal, unashamed of our shortcomings, without our clothes or our personalities or our adornments or our learning to hide behind? How did this idea enter the collective Irish consciousness? According to the Kuzari argument, there are only two possibilities: Either (1) it actually happened and individual Irishmen passed the story along father to son; or (2) At some point in history one person, or several people, presented this story to the Irish people (your ancestors fought a war against the gods) and they accepted it as truth. According to the Kuzari argument, (2) is impossible. Therefore, according to the Kuzari argument, the story of the Irishmen fighting gods is true. Um, what is the Kuzari argument? I agree that this is 100 percent how men watch gymnastics. Meanwhile women watch gymnastics going, "Do you see how fat her thighs are?" It seems to me that if we non-Likud loving Americans are 100 percent never allowed to speak about Israeli politics because "we don't understand" and are "sitting in armchairs in NY", any American-Israeli who is stupid enough to support Trump should likewise be told to keep his mouth shut. Koch brothers, Romney, Bush and now the Harvard Republican Club is also ‪#‎NeverTrump‬. 2) Taught in the 80s that Republicanism is cool, they haven't been able to adjust to the new reality. They are the equivalent of the often bemoaned liberal democratic voters who fell in love with FDR and were never able to vote GOP again. Not incidentally these same guys also won't wear slim suits. The club, which calls itself the "oldest College Republican organization in the nation," said Trump represents a "threat to the survival of the Republic." Today at Camp Agudah we got visited by some Rabbis. They had a secret meeting and we got to peer in through the windows. It was cool. Send more nosh. meeting in Camp Agudah of Moetzes Gedolei Hatorah (July 2016) from Agudath Israel on Vimeo. I'm a moron and my so-called adult child is weak and helpless. He was offered the opportunity to meet a girl whose parents are clearly shallow nitwits. Should I force my son to go through with it? TELL ME WHAT TO DO YATED! Last night a top Trump advisor told Twitter that Khizr Khan, that sweet old Muslim man from the DNC, is an agent of the Muslim Brotherhood. Presumably this lousy slander is the Trump organization's new approach to dealing with the political damage Khan is causing after insulting his wife, and mocking the Gold Star family's sacrifice failed to shut him up. Is there anyone sentient who can't see how beyond the pale these people are? I mean look at the roster of Republican elites. Bush, Romney, McCain, Kasich, the Koch brothers - all of them are sitting out this election. Is the sane and responsible Republicans won't support Trump, what's your excuse?